> Since Visionary Dance has been kind enough to let me take the Power Belly weight-belt workout without actually knowing how to belly dance, I thought it was time to learn the basics. The introductory class turns out to be yet another great group of women (and one young man, who seems to be with two women from his high school). And Dahlia Moon is great teacher. Dahlia Moon does “modern Egyptian” belly dance, which is a very elegant style associated with movie and cabaret performances. Delilah, who founded Visionary Dance and teaches Power Belly, does what’s called American Style, but I’m told she does a take on it that’s uniquely her own. 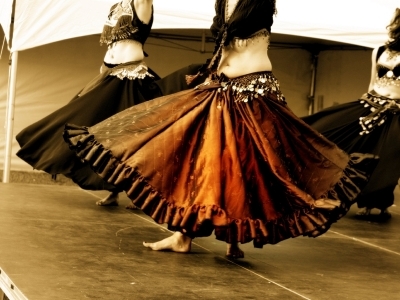 There’s a third style called American Tribal that has New Age and, sometimes, Goth elements; the photo (above) is of Tribal belly dancers. A few of the warmups we did tonight were similar to the ones I did last night at the African dance-based workout. The “snake arms,” on the other hand — those were something else entirely.